The idea to present Karlheinz Essl's Lexikon-Sonate at the Banff Centre for the Arts emerged from my own compositional work carried out this far in the context of my residency in the Centre's Music and Sound Program. My interest in exploring alternatives to the presentation of music in the traditional concert situation, led to the conception of my music installation project Camera musica for which I am currently realizing the first sketches at the Centre. In the context of this project, the work of Karlheinz represents an important reference point for me. In 1992, when Karlheinz was commissioned to write a piece [Entsagung (1991-93) for flute, bass clarinet, prepared piano, percussion and the IRCAM Musical Workstation] for IRCAM (the music department of the Centre Georges Pompidou in Paris, and my place of employment), he started to use IRCAM's MAX program to reformulate and extend the compositional strategies he developed before in his own LOGO-based computer-aided composition environment. Having already cooperated with Karlheinz on several occasions since the time of our student days in Vienna, it was only natural that we had an intense exchange of ideas concerning computer-aided composition during his time in Paris. At this time he also started to develop his Real Time Composition Library (RTC-lib), a set of MAX program modules on which the Lexikon-Sonate is based, and to which I contributed some of the very early and basic concepts. For my music installation en face (presented at the 1993 Mediale Festival in Hamburg) I developed a set of programs inspired by our cooperation in Paris, but tailored towards my own compositional requirements. Since then we have not had the opportunity to collaborate again and it was only here at the Banff Centre that I found the time to return to the ideas we exchanged in 1992. This is why I started to analyze the Lexikon-Sonate, one of the main pieces he realized with the Real-Time Composition Library. And since the Banff Centre owns a player piano, I had the chance to directly experiment with the MAX program that represents the composition. This program offers many different ways to influence the unfolding of the music - from a very rudimentary level as presented in this installation, to the most advanced possibility to extend the composition by adding new modules to it. While exploring the piece in various ways I also adapted it to the particularities of the Centre's instrument, a Yamaha Disklavier upright piano. The original version of the piece was premiered on a Bösendorfer SE Grand Piano at the Austrian Radio during a life-broadcast in Vienna in 1994. In the course of this performance, the radio audience could influence the development of the piece by calling in to the radio station. The decision to present the Lexikon-Sonate in the form of an installation is my response to some of the many questions this piece raises for me. In question are the classical concepts of music composition, presentation, distribution, and perception. Thus, it does not appear evident to me that the classical concert situation is the ideal context to present music of such a kind. Especially the absence of a performer, the general allure of the music and the possibilities to affect its evolution, almost call for a presentation in an installation. The openness of the installation situation - listeners may come and go as they like - finds its correspondence in the openness of the music, which has no beginning nor end. I confronted Karlheinz with the idea of presenting his piece in an installation at the Centre and his enthusiastic response motivated me to share this experience with the community of artists here. I chose a very simple and informal, yet carefully arranged situation. I consider this installation an appropriate context to display the piece, as well as a good opportunity to provoke discussions about it. From a compositional point of view, the most important particularity of the Lexikon-Sonate is probably that it is not presented in a traditional music score - a text to be interpreted by a performer - but that it manifests itself as a computer program - a text to be executed by a machine. Thus, in composing this piece, Karlheinz was not concerned with scoring the music, but with devising a set of rules or mechanisms (a kind of meta-composition) which describe the overall development, as well as the detailed articulation of an infinite stream of piano music. Instead of writing one piece, Karlheinz created a model which describes and is capable of producing an unlimited amount of intimately related pieces - the proliferation of an idea. Each performance of the Lexikon-Sonate displays only a particular fragment of an irreproducible whole. Although not even Karlheinz will ever hear his own piece entirely, the possibilities of its unfolding were present in his imagination when he composed it. 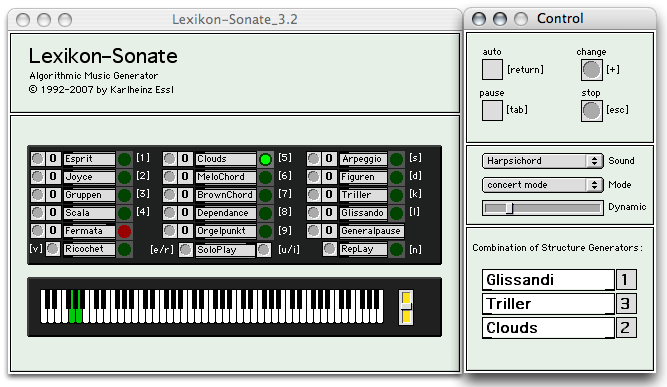 The version of the Lexikon-Sonate presented in this installation consists of 15 independent music generating modules. Karlheinz writes the following about these modules: "Each module generates a specific and perceptually characterized musical output due to a certain compositional strategy applied. A module represents an abstract model of a certain musical behavior. It does not contain any pre-organized musical material, but a formal description of it and the methods applicable to it. The idea of 'autopoiësis' - material organizing itself due to specific constraints - plays an important role. By using different random generators which are controlling each other (which from a 'serial' perspective, form a scale between a completely deterministic and a completely chaotic behavior), new variants of the same model are generated. Variants may differ dramatically from each other, although they are always recognizable as 'instances' of the given structural model." The different modules are combined in such a way that always three of them are operating at the same time, but with different significance. There is always one module which forms the background for another one performing in the foreground and there is a third one with medium importance assigned to it. The possibility to influence the development of the piece (interact would be a too strong word, since it implies action and reaction, both of which require intention, which, in my opinion, can hardly be expected from a computer) is reduced in the installation to replacing the oldest of the three modules by a new one when pressing a foot pedal. 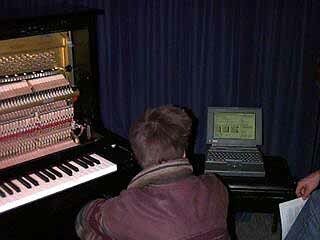 The modules currently operating are displayed on the screen of the computer controlling the player piano. If the foot pedal is not pressed for a certain time, the piece will start to change state autonomously in order to avoid a structural suspension of the music.